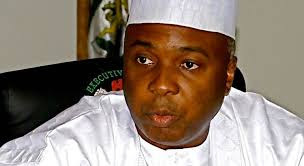 Nigeria's Senate President Bukola Saraki, on Wednesday issued a statement on celebrating the return of Amina Ali Nkek, one of the kidnapped Chibok Girls. "Amina’s return should strengthen our collective belief that our missing daughters and sisters from Chibok that are still held hostage will eventually be returned," he said. "As we join the Nkek family to celebrate Amina today, we must also remember and continue to pray for the remaining families that are still yet to see, hear from, or locate their daughters," he enjoined Nigerians. "The 8th Senate is determined to provide appropriate legislation to protect lives and properties of every Nigerian," he added.